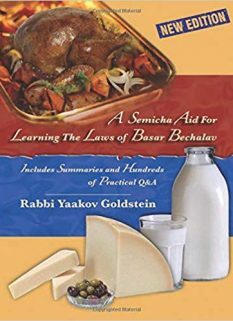 The Av Melacha-Shearing wool from skin: One who shears [hair/wool] whether from alive or dead animal, whether from a domestic and wild animal, even from skin that has been removed, is liable [for a sin offering]. Doing so is amongst the principle Shabbos Melachas as in the Tabernacle they would shear the skin of the Techashim and rams. Removing ones hair/nails with fingers/teeth: Similarly one who removes his hair and nails with his hands or teeth is exempt [from liability]. However it is Rabbinically forbidden to remove [hair or nails] with ones hand even from another person, despite the fact that one is unable to train his hands to skillfully remove [the hair/nail] with his hands, without use of a vessel, when removing them from another person. Cutting one’s hair with a vessel: However if one cut them with a vessel he is liable even on only two hairs. On one [hair] he is exempt [from a Sin offering] although doing so is Biblically forbidden as [is the law by all] other half measurements [that they are Biblically forbidden]. One who removes a white hair from amongst black hairs: One who gathers white [hairs] from amongst black hairs so he not appear old, even for [removing] one [hair] he is liable [for a sin offering]. Doing so is even forbidden during the week due to the prohibition against “a man wearing the garment of a woman” which is defined as a man may not adorn himself like the adornments of women. One who cuts not for the need of the cut item: One who shears and cuts nails with a vessel is liable [for a sin offering] unless he needs the wool or the hair or the nails which he cut. However if he does not need them then this is a Melacha which is not needed for its own sake [which is only Rabbinically prohibited according to some opinions]. First opinion-Gentile may cut with vessel: [Based on the above] therefore a woman which forgot from before Shabbos to remove her nails and on Shabbos is her night of immersion there is an opinion which permits her to tell a gentile woman to cut it for her, as all matters which are only Rabbinically forbidden are permitted to be done through a gentile for the need of a Mitzvah as is written in chapter 307 [Halacha 12] and 325 [Halacha 5]. The reason for this is: (as the principal Melacha [of shearing] is removing the hair and wool from the skin and the nails from the fingers, and he does need this removal in it of itself, and furthermore) also in the Tabernacle they would shear the skins of the Techashim even though they did not need their hair. Therefore one may not allow to ask a gentile woman to cut the nails being that this is a complete Rabbinical prohibition which was not permitted [even] for the need of a Mitzvah as was explained in chapter 276 [Halacha 8]. Rather one may tell her to remove them with her hands or with her teeth which is a Rabbinical prohibition upon a Rabbinical prohibition. It is forbidden to cut a blister from one’s body whether with ones hand whether with a vessel, whether for himself whether for others, whether it is [filled with] puss [blister] whether it is dry. And if one cut a puss [filled] blister with a vessel he is liable for shearing according to those which hold one liable for shearing even if he does not require that which is being sheared. The Av Melacha-To write, or erase with intent to write: One who writes, and erases in order to write in the erased area, is one of the primary Melachas. [This is derived from the work done in the Mishkan] as [in the Mishkan] they would write on the beams of the Tabernacle as signs to know which beam corresponds to it, and at times they would make a mistake and erase what they wrote and then return and write in that place [the correct signs]. To erase without intent to write: However to erase not in order to write within that space was not done in the Tabernacle, and is not similar to a Melacha at all. Liability for erasing ink splotches and removing wax in order to write: Since the liability for erasing is due to him doing so on behalf of writing, which means that he is fixing the area to write on, therefore even if he did not erase letters but rather erased mere splotches of ink, or wax which fell on the tablet [he is liable]. [This tablet] refers to a wooden writing board which is smeared with wax and inscribed onto using a metal pen. [Thus if it were to happen that] external wax fell on this board and one erased this wax and removed it from there in order to engrave in its place on the wax that is under it which was smeared on the board [to begin with], then he is liable. Liability is only on two letters: [However the above liability] is when there is enough space [in the erased area] to write or inscribe two letters, and similarly one who writes or erases letters is only liable on two letters, however on one letter he is exempt, although this is [still] Biblically forbidden as are other half measurements. Removing wax from parchment in order to write: This law similarly applies to one who erases and removes wax from the parchment in order to write in its space. Removing wax from letters to see better the letters: As well this is the law for one who removes wax which dripped on the letters, as what is the difference if one fixes a place for writing or if one fixes already written letters, and on the contrary this [latter erasing of wax to see the current letters] is more of a fixing [than the erasing of wax merely to write on it in the future]. [However] there are those which are lenient in this. Rabbinically forbidden to erase even without intent to write: Rabbinically it is forbidden to even erase not for the sake of writing [in its space]. Forbidden to eat cake with letterings: It is therefore forbidden to break a cake which has on it forms of letters, even though ones intent is simply to eat [the cake] as he is [nevertheless] erasing [these letters]. 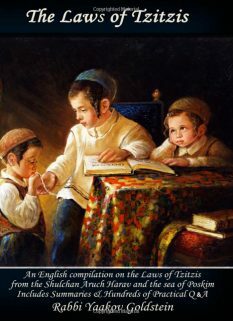 First Opinion-Is forbidden: [Regarding] those books which have letters written on the top edges of the pages there are those which prohibit opening them on Shabbos due to the erasing prohibition. As well as [they forbid] to close them due to the writing prohibition. The reason for this prohibition: Now, although they have no intent to do this [writing or erasing, nevertheless it is forbidden as] it is an inevitable occurrence. Other Opinions-Is permitted: [However] there are those opinions which permit to close [the books] as since the letters are already written and it is just that they are lacking proximity, this does not contain a writing prohibition, as since it is possible to bring them close together easily without doing any new action they are considered like they are close and standing and one is doing nothing with this proximity. Similarly it is permitted to open them for this reason and one is not considered like he is erasing them as their writing [remains] intact and it is possible to near them to each other easily and they are [thus] considered already now to be] as if [they are] close. The final ruling: And so is the custom [like the latter opinion]. One who edits one letter such as he removed the roof of the “Ches” and turned it to two “Zayins” is liable. (And one who edits another single letter such as he removed the roof of the “Daled” and turned it into a “Reish” is exempt [from liability of a bringing a sin offering] although doing so is Biblically forbidden). One is only liable for a permanent writing: One is only liable [for a sin offering] when he writes with an item [whose mark is] permanent on top of a material [which the writing on it will remain] permanent. Rabbinically even a temporary writing is forbidden: However it is Rabbinically forbidden [to write] even with an item [whose mark is] not permanent on top of a material [which the writing on it will] not [remain] permanent, such as to write with liquids and fruits juices on top of vegetable leaves and the like, and therefore one must beware not to write with his fingers on the liquid that is on the table or to engrave in ash or congealed fat or honey. Writing in the air or on a clear table: It is permitted to write in the air forms of letters being that their mark is not at all recognizable. The same law as well applies to [that one may write figuratively] on a table that does not have liquid [in that area], as well in this case the mark is not at all recognizable. Now although through doing so one trains and builds his hands for writing, this is [Halachicly] meaningless. 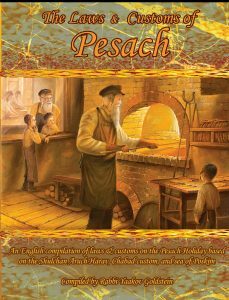 It is as well permitted to view a craftsmanship on Shabbos even though he is learning it in the process. Tearing letters into leather: One who tears onto leather [letters which shape] the form of writing is liable, as engraving is a form of writing. Marking letters on leather: However one who marks [with his finger] on the leather the form of writing is exempt [from liability to bring a sin offering] as this is not something which will last. Nevertheless this is Rabbinically forbidden due to a decree against [writing in a] permanent [method]. Making a mark on leather as a reminder: However if [the writing] does not have the form of writing and he is making a mark as a mere symbol, and it does not have the form of letters [or recognized symbols, such as a mere indentation], it is allowed even initially. Making a mark in a book as a symbol for editing It is therefore permitted to mark with ones nail on [the page of] a book [made of parchment], like those which make a mark as a a place where there is a mistake. Making a mark on paper: However this only applies by parchment which is hard and its mark thus does not last, however on paper it is forbidden to mark being that its mark lasts for a long time. Now although [the mark] is not a form of writing it is [nevertheless] Rabbinically forbidden due to a decree against [coming to mark] a form of writing on which one is liable on when it lasts. Other Opinions by making marks on parchment: There are those which prohibit [making marks] even on parchment. Their Reasoning: as they hold that even one who makes a mark for a mere symbol and not like a form of writing is liable [to bring a sin offering] if it is a permanent mark, as they too [in the times of the building of the Tabernacle] would make marks on the boards of the Tabernacle to know which [board] corresponds to it. Therefore if one marked one marking on top of two boards, or two lines on one board, as a symbol as was done with the beams of the Tabernacle, is liable [to bring a sin offering]. [However] one marking on one board is exempt [from liability to bring a sin offering] although is [nevertheless] Biblically forbidden, being that it is a permanent matter [mark]. [Therefore] one who makes a mark on parchment in which [the mark] will not last is Rabbinically forbidden due to a decree against [coming to make a mark which] permanent. The final ruling: A G-d fearing [person] is to be stringent upon himself like their words [to avoid making marks on even parchment]. Writing symbols: All the above is when [the mark] is not at all in the form of writing, however so long as [the mark] is in the form of any writing, even if it is not the Ashury writing, even if they are unknown letters which are only used for symbols, such as the symbols which are commonly used to refer to the numbers, then it is considered the form of writing and one is liable [to bring a sin offering] on doing so if it was done on a item [in which the writing will be] permanent. If it was done on an item which [its writing will] not [remain] permanent] it is Rabbinically forbidden according to all. Writing שעטנז גץ without the Zayins: One who writes in Ashuris and omitted the זיונין from the letters of שעטנז גץ is exempt on [liability to bring a sin offering] over them being that their work is incomplete. Writing an incomplete letter: Similarly all writings from any language which its letters were not completely written one is exempt [from liability to bring a sin offering in having written them]. However it is Rabbinically forbidden [to do so]. Writing in Rashi Script: Therefore one who writes a fine print called “Meshita” [i.e. 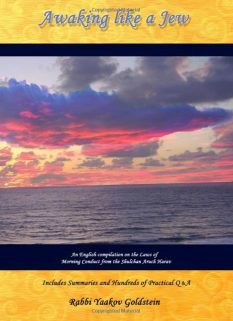 Rashi script] there are those which say that he is exempt from [liability of bringing a sin offering] over it, due to that this script was taken from the Ashuri script, and it is thus similar to an incomplete Ashuri script [of which one is not liable on] as will be explained in chapter 545. Making letter necklaces: If one inserts silver letters into a clothing, it is considered writing and is forbidden to be done on Shabbos. Drawings and designs: One who makes marks and designs on a document and the like, in the way that the artists design, is liable to an offshoot of the writing prohibition. The same applies for one who erases it. The Av Melacha-On skins: It is common for the leather makers that when they come to cut the leather they first scratch a line into it in accordance to how he wants to lengthen, widen and shorten the cut, and afterwards he passes the knife over the marked line. This was also done by the skins of the Tabernacle when they were cut, and therefore this line marking is one of the Principal Melachas . Making lines on paper and parchment: Similarly one who imprints a line into even parchment or paper in order to write straight is liable [for a sin offering]. The Biblical prohibition: One who sews two stitches and [makes] a knot [at its end], or three stitches even if he does not make a knot [at its end] is liable [to bring a sin offering]. However [one who sews] two stitches and does not make a knot is exempt [from Biblical liability]. The reason for this is: because [in such a case the sewing] does not last. 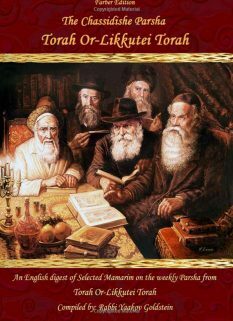 Rabbinically forbidden to make two stitches without a knot: However it is [nevertheless] Rabbinically forbidden. Tying prohibition: One who makes a knot [in any of the above cases] is also liable for the tying prohibition. A clothing which was sturdily sewed and its thread was left sticking out, and two parts of the clothing slightly split apart from each other, and the threads of the sewing are sticking out, then if one pulls the head of the threads in order to tighten and connect the two sides, this is considered sewing and one is liable [to bring a sin offering]. [This applies] even if one has not made a knot [at its end] if [the amount that the clothing have reconnected] is like the amount of three stitches. Pulling the thread that tightens the sleeves of shirts: Those [people] who tighten their clothing around their arms through [pulling] a thread which pulls and tightens it, [are forbidden to do so as it] is forbidden to pull [such a thread] on Shabbos due to the sewing prohibition. If the holes are wide, round, and sewed: It is only allowed if [the shirt] has slightly wide holes which are fixed in with sewing and [the hole is] round in circumference, in which case it is no longer similar to sewing. Walking into a public domain with a needle attached to this thread: [In the above circumstance that the holes are wide, round and fixed with sewing] then even if the thread is inserted into a sewing needle [a needle with a hole] it is permitted to go out with it [into a public domain] since it is always connected to the thread, and the thread [is always connected] to the clothing, and it is thus an accessory to the clothing. If one is able to remove the clothing without loosening the tightened thread: If the clothing is not very much tightened by this thread to the point that one must loosen it when he removes [the clothing in order so it come off], but rather at times he changes his mind and decides to leave it this way eternally being that he is [anyways] able to remove it this way with it remaining slightly tightened, then it is forbidden to tighten it on Shabbos in all cases [even if the holes are wide and round and are fixed with sewing, and even if he does plan to loosen it]. The reason for this is: because perhaps one will change his mind and decide to leave it this way forever, and it is thus found that he made a sewing which will last, and by a permanent sewing it does not help the fact that the holes are wide and are fixed with sewing and are round. The Av Melacha: The action of Meameir [gathering stalks] is one of the principal Shabbos prohibitions which occurred in the Tabernacle with the planted herbs. Gathering in area of growth-First Opinion: It is only considered [the Melacha of] Meameir when one gathers [the produce] in the area of its growth, similar to a harvested stalk of which the ears of grain are gathered in their area of growth. Gathering fruits: Similarly one who gathers fruits and joins them together in the area where they fell off the tree [has transgressed the Meameir prohibition]. Gathering from area not of growth-Permitted: However if the [fruits] have dispersed into another area [out from its original place of growth] then it is permitted to gather them as written in chapter 335 [Halacha 5]. Items that grow from the ground: The [Biblical] Meameir prohibition only applies with [the gathering of] items which grow from the ground. 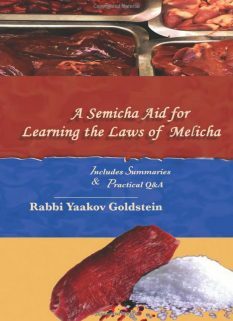 The Rabbinical prohibition-Items that do not grow from ground: However Rabbinically it is forbidden to be done even with items that do not grow from the ground to gather them in their area of growth, such as to gather salt from the evaporated deposits of water, which evaporates the water and creates the salt and so too with all cases of the like. Second Opinion-Making items into one mass out from their area of growth: ([However] there are opinions which say that one who presses fruits [together] until they form one mass is liable for Meameir even when he does so not in the place of its growth such as) one who gathers figs and makes from it a round cake [of pressed figs] or punctures the figs and enters a rope through them until they gather and form one mass, then this is an offshoot of the Meameir prohibition and one is liable, and so too any cases of the like. One who places flax or sesame seeds into water and the like is liable for kneading [according to all opinions] being that they [the water and the seed] mix and stick to each other. Cutting an item with a knife to make a use with it: Although cutting items detached [from the ground] is initially permitted when one is not particular to cut it in a specific measurement, as explained in chapter 314 [Halacha 16] nevertheless if through doing so one fixes the item to be used for a certain use, then he is liable for [the] “fixing a vessel” [prohibition] if he cut it using a knife as was explained in chapter 322 [Michaber Halacha 4] regarding the cutting of a twig. Tearing it with ones hands to make a use of it: If it was done without a knife then one is exempt [from Biblical liability], although it is [Rabbinically] forbidden. Separates papers that are attached: However one who separates papers that are attached is [liable for doing] an offshoot of [the] tearing [prohibition]. Gluing things together: One who attaches papers or skins with glue of the scribes and the like is [doing] an offshoot of the sewing [prohibition] and is liable. Separating items which were accidently attached: However this only applies when the attachment was done for it to last, however pages of books which have attached to each other through wax [which fell on them] or at the time of their binding, are permitted to be opened on Shabbos. The reason for this is: as since [this attachment] was not made to last and furthermore it was done on its own without intent, therefore it is not at all similar to sewing, and it does not contain [the] tearing [prohibition]. Fixing a needle: A needle which has become bent, even slightly, is forbidden to be straightened. Meaning that wax from the outside fell onto the original wax layer, thus making a further wax layer on that part of the board and making it uneven. This refers to the small Zayin letters which protrude on the very top of each of the letters in the grouping of Shatnez Gatz. Other Opinions: The M”B 340/22 rules that one is liable even in such a case being that Halachicly the Zayins do not invalidate the letters. done for its first time due to that doing so is considered fixing a vessel. Meaning even according to the first opinion mentioned in 321/16, as stated explicitly in Rambam that one is liable for kneading in such a case despite that he himself rules like the first opinion. There it is explained that cutting wood to a desired measurement is Biblically forbidden. Evidently this refers to the law that if one were to cut a twig with a knife for a use then he is Biblically liable. There Admur brings different cases that tearing or breaking an item is forbidden due to one making it now fit for a use. The Mishneh Berurah in Biur Halacha “Eiyn Shovrin” says that the prohibition applies even when tearing a single entity.